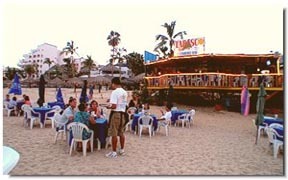 Great Open Air Atmosphere Our location on Medano beach is just perfect! Besides the excellent ocean view and the tranquility of the area, our staff will make sure you feel comfortable in any of the different areas we have designed exclusively for you. Our Sun Deck - Have your meals at this magnificent cozy deck. Located only a few feet above water, there is a word that describes best the feeling of being sitting on our Sun Deck... Full Relaxation! Our Beach section - All our tables at the beach section have big umbrellas for shade during the day, at sunset we take away all umbrellas and set our tables in a romantic mood with center candles. Open from 8:00 a.m. to 11:00 p.m. for breakfast, lunch & dinner. 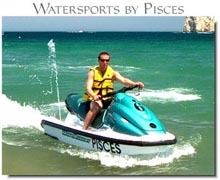 We also carry a large number of Lounge Chairs with Umbrellas. A Beach Volleyball court is set every day for your ATP matches. Fresh water shower for your has been installed on the premises for your convenience. Restrooms and Parking are also available. Cabo san Lucas, Baja California Sur, MÃ©xico. Our location on Medano beach is just perfect! Besides the excellent ocean view and the tranquility of the area, our staff will make sure you feel comfortable in any of the different areas we have designed exclusively for you. I just talked to a girl from the Yahoo cabo forum and she used Tabaco's for her WD last week. She said the food was great and everyone had a great time. She also said that her guests went over their $1,300. bar limit. Ouch! She had about 60 guests. kash, i don't have prices..i have a feeling it depends on the group size..
Kash - I'm having a welcome margarita bonfire there on Thursday, Nov 2nd. We have about 30 people that will be there that night. For the bonfire part, we have a $500 minimum bar tab. We are still negotiating the food price, I will let you know what we end up with. So far they quoted me $24 pp for a plated fajita dinner. This includes a tostada for appetizer, the fajitas, and the first drink (soda, water, nat'l beer, or margarita.) I don't know what the a la carte prices are, but I thought this was a bit high. Since we have 30 people, we may end up doing a buffet (they did not want to do a buffet dinner unless it was 30 or more people). I'll let you know when we have everything figured out. Can you please give me points to download the menu from Tabascos? I am pretty sure we're doing our welcome dinner at Tabasco's. We were quoted around $30.pp for fish and shrimp for dinner, and an $850 min for bar tab for 65-75 guests. I spoke with Pablo the owner/manager and he was very helpful. You can have a beach bonfire dinner for $24 per person. He charges 40.00 per bonfire which is a steal compared to Baja Beach Cantina charging 650.00 per bonfire. He was very nice and to make my reservation I did not even have to give him a deposit.